Swinton Roofing Contractors Limited are a roofing company based in Eccles, they are highly experienced roofing contractors covering Manchester, Bolton and the surrounding areas. From roofing and re-roofing to new flat roof installations and chimney repairs in Manchester, Swinton Roofing Contractors can provide you with a cost effective roofing solution for your home or business. Are you looking for a Manchester roofer to install your new roof in Bolton or carry out chimney repairs in Manchester? 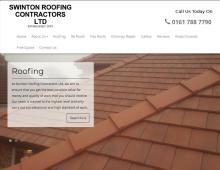 Contact Swinton Roofing Contractors Limited – roofers in Greater Manchester.